Few days ago, Boeing released 2013 results [PDF, 841KB]. The company reported revenues of over 86.6bn$, 648 commercial deliveries and 1,355 net orders for its commercial aircraft. All these were widely reported by the media and mean a great year 2013 for Boeing (with increases in these metrics from 6 to 8%). plus services revenues (less than 0.3bn$ from the commercial aircraft unit – calculated, not reported). The discount figure that minimized errors last year was 45%. Using this figure, the error obtained this year in relation to Boeing Commercial Aircraft reported revenues is 3.9%, much too high. The best estimate for last years average discounts were: 45% for 2012, 41% for 2011, 39% for 2010 and 38% for 2009. The updated figure (which minimize errors for 2013 down to 0.2%) for the discount for Boeing commercial aircraft is 47% (3). The explanation I can find for that increase shall be linked the built-in penalties for 787 plus the introduction of the new 787-10 with increased discounts for the launch customers. (1) Find here what is becoming a “body of knowledge” on Boeing discounts: estimates calculated for 2012, 2011, 2010 and 2009; a review of the French portal Challenges.fr of aircraft discounts prior to Le Bourget airshow of 2013; a Bombardier’s CEO statement on what is known in the market as the Boeing discount; Boeing Commercial Airplanes president Ray Conner speaking about the more aggressive pricing they are being forced to offer. (2) Two years ago, I received a comment from the analyst Scott Hamilton on the level of downpayments. He mentioned they could reach up to 30%. I tried this time to compute the calculation using that input, though the figures of discounts to be applied each year to minimize errors would have to be even higher, over 50% (! ), thus I stayed with the 3% used in the above-mentioned published paper to stay on the conservative side. 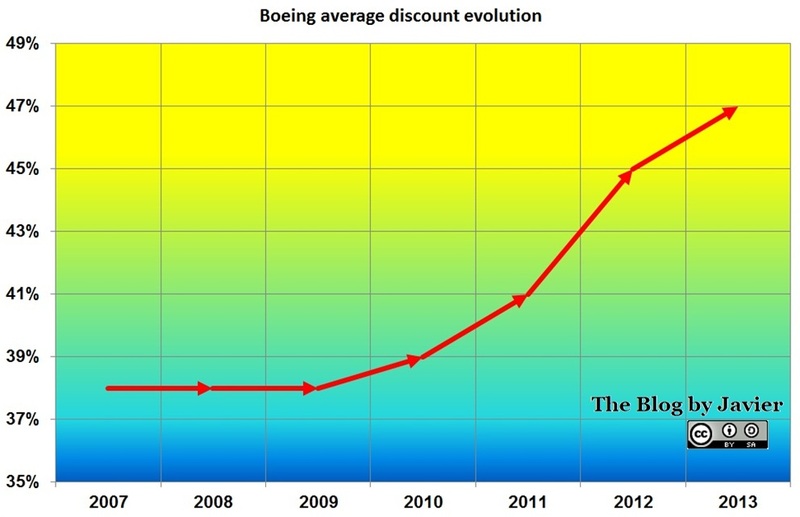 (3) I find this trend of continuous increases in Boeing discounts in line with both Challenges.fr report and Ray Conner’s mentions of aggressive pricing last year, both referred to in note (1). Thank you for your interesting computations. I however believe that they include a methological flaw, which could easily be corrected. You do not have to take deposits into accounts, because these payments are not sales. Though entrusted to the manufacturer, the deposit belongs to the customer. The manufacturer therefore considers it as a liability. The aircraft ordered by a customer remains the manufacturer’s property until delivery is accepted. Then only the sale is fully recorded. If, as is usually the case, the deposit is used as part payment for the purchase, then the debt is cancelled accordingly. It follows that the sales of a given year are not inflated by the value of deposits received that year, and that you should not bother with them at all. Hello Philidor, thanks for your comment. The issue of whether or not letting the % of the airplane price given at the downpayment as part of the revenues computation is a valid point. I do think it should not be taken as I understand that is related to cash flow only instead of profit & loss. Nevertheless, if attached to that % an invoice is generated it should be included into the calculation against revenues. Since, I have no view of what Boeing invoices I decided to take it into account. On the other hand, the minimum % used, 3% (based on the paper mentioned in the article), has a minimum influence, i.e., if we did not take anything into account, the result for average discount would be ~ 45.5% instead of 47%. The other point you make: taking into account deliveries instead of orders, that is precisely what I do. Match the 648 a/c Boeing delivered in 2013 against the list prices per model.